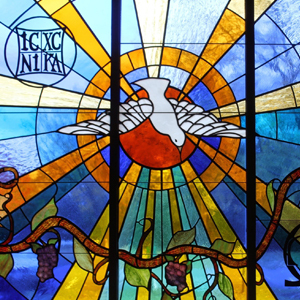 After Jesus is baptized by John in the waters of the Jordan, he is baptized by the Holy Spirit, who appears in the form of a dove. And the voice of God the Father proclaims Jesus his beloved son. The Christian belief that Jesus was commissioned through his baptism to do battle with the Devil is reflected in the monograms inscribed in this window. In the upper left corner are the Greek letters IC XC NIKA. IC, Insous, is the Greek spelling for the name Jesus, XC, Christos, stands for the title of Christ, which is the Greek form of the Hebrew word Messiah, NIKA is the Greek word for victory: Jesus the Christ will be victorious. The letters Alpha and Omega in the bottom right corner represent the words of Jesus. “I am t he first and the last.” The M in the middle of the monogram means Jesus Christ is the same – yesterday, today and forever.